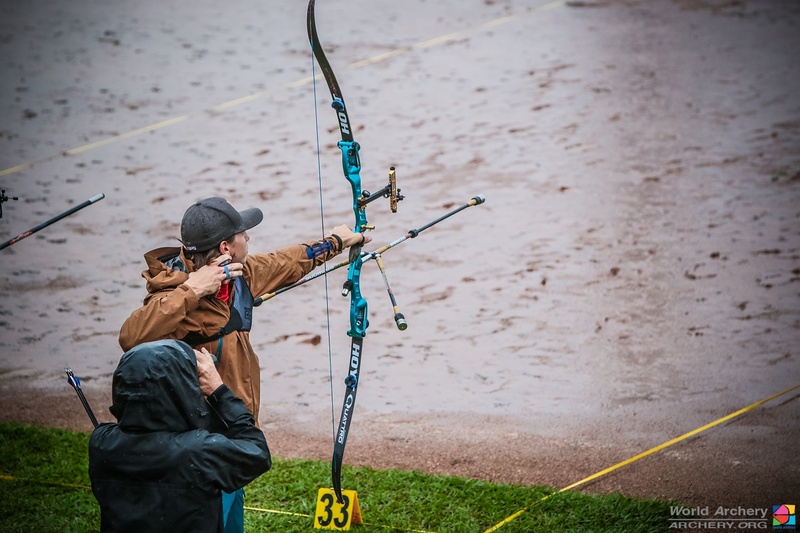 We are in Medellin, Colombia for the second leg of the year’s Hyundai Archery World Cup circuit and the weather forecast – in one of the usually sunniest stages of the circuit – is wet, very wet. The temperature: an average of 25 degree Celsius with an 80% probability of thunderstorms (or at least a lot of water falling from the sky) for every day this week. “Rain can make you feel tense or cold, you can even get sick,” said Ku Bonchan, who was selected for the Korean Olympic team for Rio 2016 two weeks ago. It’s something Japanese archer Hayashi Yuki thinks it can be solved by shooting fast. “Rain can be hard or easy. I prefer to shoot fast and don’t take too long as arrows can get heavier with the rain and fall below your aim, rather than to the yellow rings,” she said. Not all rain is the same. Two time Hyundai Archery World Cup Champion Sara Lopez had problems with her peepsight while shooting in adverse conditions. She has now found a way to avoid them. “Many people know about my problem with my peep because of the rain. It used to get wet and messed up everything,” she said. At the Shanghai stage of the Archery World Cup in 2014, Lopez lost the final after a miss because she couldn’t see through her sight properly. “Be sure your release is not too slick,” world number three Sebastien Peineau added. “We use camera lens gear that blows on the scope, and doesn’t wipe the water or smear it, and that gives us an advantage,” said Reo Wilde.